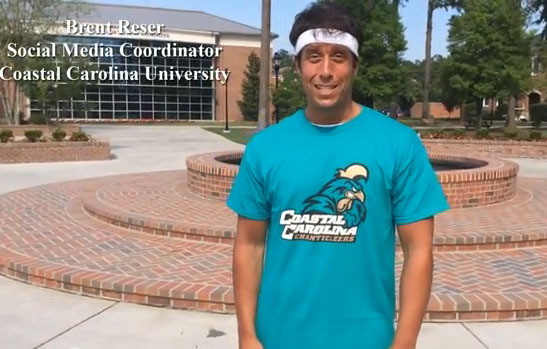 I am blessed to say that all of my days at Coastal Carolina University are good days. But I would be remiss if I didn’t say that some days are even better than the good days. Today was one of those. After I left work yesterday I received a call from our awesome and valuable administrative assistant, Kim. She told me that a 9 a.m. meeting had been scheduled for today. I thought something semi-urgent must have come up that our communication team needed to talk about. This morning at about 8:30 a.m. Kim came to my desk and told me that the meeting would just be with me and our Vice President for University Communication (Bill Plate – My Boss). She also added that the meeting would start in his office at 8:55 a.m. My head started to turn. What was up? Did I do something wrong? I went into Bill’s office and he just asked me to help him establish some goals for an accreditation program. Right away at ease, I brainstormed some ideas with him. After discussing a couple more topics our meeting concluded. I walked out of his office and strolled down the hall to my desk. Once I passed through the hallway and made it to our office’s lobby area I was greeted with a special surprise. Across from me stood all of my University Communication co-workers and superiors. Our university photographer was present and he had his camera fixated right at me. 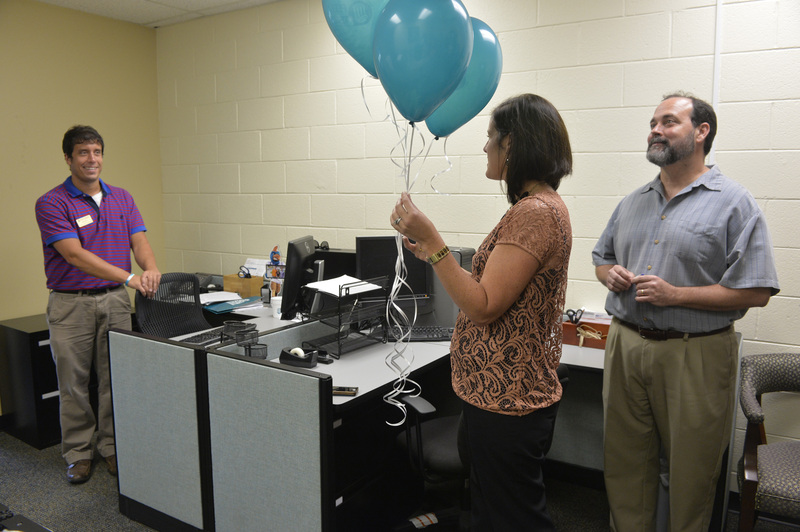 Right in front of the whole group holding a bunch of teal balloons was Eileen Soisson, the Director of Service Excellence at Coastal. Everyone was starring at me and everyone was smiling. Eileen Soisson addresses me this morning. I swear that there were more people watching than just our crazy Director of Creative Services Rob Wyeth (Thank you to our University photographer, Bill Edmonds for the photo. Thank you to Mona Prufer for passing the photo C.D. onto me). Eileen, the woman who is in charge of the innovative and popular “Feel the Teal” program, addressed me. She said that she was in our office today to honor me for the simple act I did last weekend. If you didn’t read my post from Monday night, I had the opportunity through a social media promotion to give my football tickets away to a student and her overseas dad who just happened to be in town for Family Weekend. It was a no-brainer on my part but the university still wanted to give me some recognition. Eileen hands me the balloons. 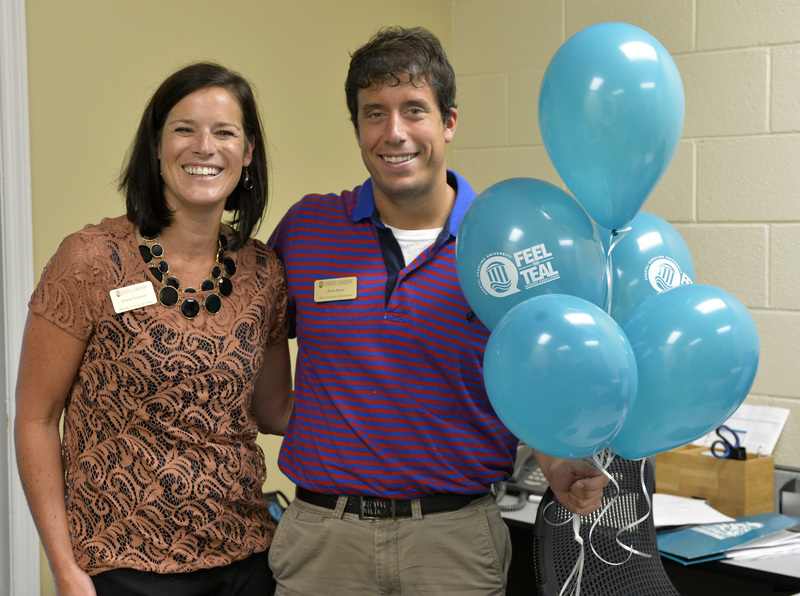 The Feel the Teal program is outstanding and innovative. (Thanks to Bill Edmonds for the photos). After saying some really nice words about me, Eileen handed me the balloons while my office clapped. It was the nicest, most genuine thing that has ever been done for me in a professional setting before. I was able to hold it together but it did touch me. This is why I am at Coastal, I thought to myself. Me with Eileen Soisson. It is easy to love a university and want to do your best when they treat you like this. Needless to say, it turned a good day into a great day. Bill, the same great boss who recognized me at the Board of Trustees meeting, orchestrated the whole thing. This morning was one of those times where a snap shot was instantly cemented into my brain. I will always have that image of all the people I work with on a daily basis looking right at me while Eileen stood in the center with balloons. I can’t thank Coastal enough for letting me implement my vision for its social media program and then honoring me simply for following through with it. I am at the right place. Don’t Blink. For the past four days a great deal of my work has centered around filming and editing videos for the #CCU Cold Water Challenge. As I mentioned in a previous blog post, Diane Fabiano, a staff member at Coastal Carolina started off the whole campus initiative by performing the challenge on our bridge that crosses over Wall Pond. She called out five fellow staff members. The next day I filmed those five people and strung it into a video. Yesterday I did the same along with today. However, one wrinkle did present itself this afternoon from the routine filming I had become accustomed to. I got to participate! Yep, right after our public safety officers all performed the challenge I bravely responded to my fellow University Communication staff member, Mona Prufer, who called me out yesterday seconds before she got water dumped on her. With my boss filming me and an employee from the finance department ready to douse me with a bucket of water I gave my talk. This was me participating in the #CCU Cold Water Challenge today. Of course I added my own personal touch to it, how could I resist? A couple things you should know: I really didn’t get hit with freezing cold water. Because public safety brought more people over than arranged one of their guys got the icy cold bucket reserved for me. So the water you see me get hit with is actually from the fountain behind me. I still smell like chlorine four hours later. I am also not exaggerating about the heat in the video, well maybe I am by a few degrees, but it was mid-90’s today. Finally, I admit that I got it pretty easy with the water. Most of it landed below my neck and I was spared the freezing jolt that 95% of the people who take the challenge receive. After the filming of my Cold Water Challenge I went into the office and edited the clips from that day’s participants to make the latest video. I then had a little fun and made my own personal video. To the people I called out you have twenty-four hours to complete the challenge. I am holding Kevin, John, and Seth to it. I am giving a pardon to Wally the Pond Turtle since he is a fictional character and I am also excusing Panther Kitty because he no longer lives on campus…and most likely is no longer even living on this earth (story for another blog post). So let’s get those buckets dumping again and if you are a reader in the Myrtle Beach area please let me know if you would like to participate in the #CCU Cold Water Challenge and I can get you set up. Don’t Blink.